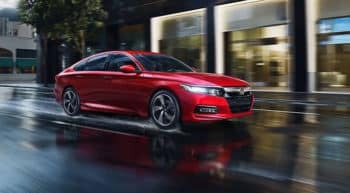 The 2018 Honda Accord is a sophisticated sedan that’s as refined as it is powerful on the road. With two turbo-charged engines and three transmission choices, including a hybrid engine option, the Accord delivers exquisite power while achieving impressive fuel economy. Inside, drivers can find a long list of features that bolster comfort, provide convenience, and offer ways to stay connected and entertained — check out the dual-zone automatic climate control, the 7-inch touchscreen display, and more. The Accord also comes standard with Honda Sensing, a suite of driver-assistive technology features that help you drive safely. The 2018 Honda CR-V is a dynamic crossover, offering drivers a compact size and plenty of interior space for both passengers and cargo. The versatile interior can be configured in many arrangements to accommodate large, bulky, or awkwardly shaped cargo items, so you never have to leave anything behind. Choose between a 2WD version or an AWD drivetrain to tackle even slippery or icy roads with added traction control. Inside the cabin, the CR-V is decked out with a multi-angle rearview camera, illuminated steering wheel-mounted controls, and more. The 2018 Honda Civic is a legend on the road. Sporty and dynamic, the Civic comes in a coupe, sedan, or hatchback version. But no matter which body style is right for you, the Civic earns incredible fuel economy with either the standard 6-speed manual transmission or the CVT. Inside the Civic you’ll find comfort features such as automatic climate control, ways to stay safely connected with Bluetooth and other hands-free technology, and plenty of style. Learn more about the 2018 Honda Accord, CR-V, and the Civic by contacting us or visiting your nearest West Michigan Honda Dealer. Explore current offers, and find the model that’s right for you with a test drive today.